JOANNA HAWROT – the winner of The Fashion Designer of the Year #BEGINDESIRE title in the HUSH Selected 2014 contest. She has been designing the thematic seasonal concepts alluding to pret-a-porter and haute-couture since 2008. The designer realises the philosophy FROM FASHION TO ART, presenting her collections by means of interactive multimedia art installations. Her designs gained international recognition during the most significant brand events in New York, Berlin, Paris and Düsseldorf. Joanna Hawrot derives inspiration from oriental culture and tradition, and creates the bridge between Asian culture and modern Europe. 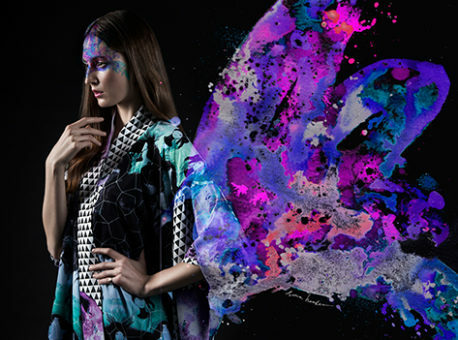 Kimono, the hallmark of the brand, is presented through the scope of illustration, painting, and modern technologies. Joanna Hawrot accomplishes fashion and art projects in cooperation with the most important Institutes of Culture in Poland and abroad.